The Tilted Bin Merchandiser is intended for organizing densely spaced, lightweight products. It offers a 4" high profile and has a 15 degree down-slope. 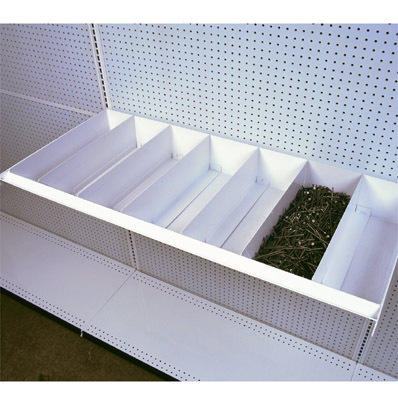 This divider is designed for exclusive use with the Nail Bin Shelf [NB-(NW)24] to form bins for various types or sizes of product. Heavy gauge pan is 4” high and has three stiffener channels underneath plus a ‘V’ shaped front lip for size/price stickers. Bin has two position brackets for versatile presentation. Freestanding dividers may be ordered separately. 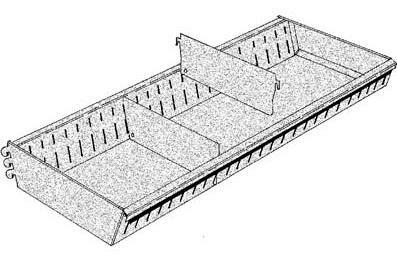 Load capacity in flat position is 550 lb and 250 lb in 15 degree down-slope. 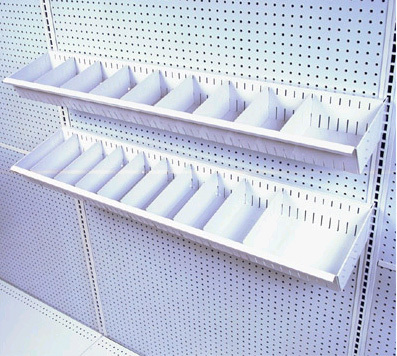 The Tilted Bin Merchandiser Dividers are intended for organizing densely spaced, lightweight products. Heavy gauge pan is six inches high and has three stiffener channels underneath plus a V shaped front lip for size and price stickers. The bin has two position brackets for a versatile presentation. Freestanding dividers are sold separately.